Large amounts (sometimes the majority) of protein in eukaryotic, bacterial and archaeal cells is often found in the form of helical polymers. Viruses infecting these cells can also be helical. 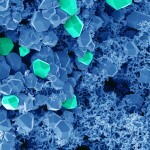 We have been using electron cryo-microscopy (cryo-EM) to study the structure and function of many of these polymers. Since the introduction of direct electron detectors into transmission electron microscopes about six years ago, there has been a “resolution revolution” in cryo-EM where near-atomic levels of resolution can now almost routinely be achieved for many macromolecular complexes. While some of these complexes can, in principle, be crystallized, cryo-EM has emerged as the method of choice for structural studies of such complexes as it does not require crystallization, uses far less sample, and is much faster. But for helical polymers most can never be crystallized and cryo-EM is not only the preferred method but the only method available for reaching near-atomic resolution. I will describe applications of cryo-EM to a range of systems, from viruses that infect organisms living in nearly boiling acid, to an archaeal pilus that is nearly indestructible, to “microbial nanowires” that conduct electrons. All of these studies provide not only new understanding of biology and evolution, but yield insights into novel structures that can have applications to drug delivery, biomedical engineering and nanotechnology.